Do you ever have periods? No, not those! I know what you're thinking. I'm talking about being 'obsessed' with something for a while. Like, at some point I'd only eat breakfast bars for breakfast. At another point, I'd cook Thai food for dinner every single night. There was a while in which I craved instant noodles whole days long. Or I'd suddenly have a coffee obsession. Or I'd be fascinated by Greek bakeries. You know what I mean right? Ever experienced something similar? Anyway, the point was: at some point I was fascinated by the Korean cuisine. Which led me to try bibimbap. And to my surprise my sister became obsessed with it - she LOVES the egg in it. Together with the stir-fried vegetables, rice and sesame/soy seasoning it was totally her thing. So I made it more often (I really liked it too). Until one day the world ended: my non-baking, non-cooking, non-foodie sister, who nevertheless has a great big appetite, asked me for the recipe! So here you go. No need to thank me, really, don't worry about it, I'm always this nice. 1. Julienne the carrots and the zucchini (cut them into thin stripes). Slice the mushroom into slices. Chop the spring onion. 4. Wok the minced meat with the garlic, soy sauce and sugar until thoroughly cooked. Take off the heat and add 1 teaspoon sesame oil. 5. Cook the spinach in boiling water until done. Transfer to a bowl of ice-water to stop the cooking-process and keep them a beautiful colour green. 6. Fry 2-4 eggs according to the amount of people you're serving while keeping the egg yolk uncooked, also known as sunny-side-up. 7. Assemble the dish by putting rice in a bowl and topping it with an egg. Place all the other ingredients in little huddles around it (optional: turn it into a rainbow!). 8. Top with spring onion, sesame oil and sesame seeds. 9. Serve as fast as you can in the hope that it's still warm! 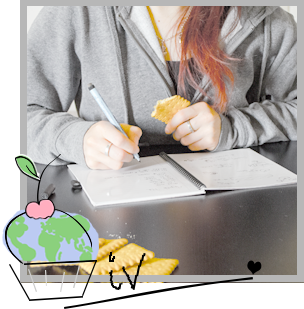 * The quantity of the vegetables depends so much on the size, I have a really hard time writing down any sorts of quantity (one big carrot or 4 little ones?). Just line up all the vegetables you want to use, think of the amount of people you're cooking for and use what you think your taste, diet and appetite calls for. ** The vegetables are more often than not seasoned with salt, soy sauce, sesame oil, garlic and/or spring onion. Most of the time I -very evilly and non-traditionally- skip this part and season the whole dish instead. 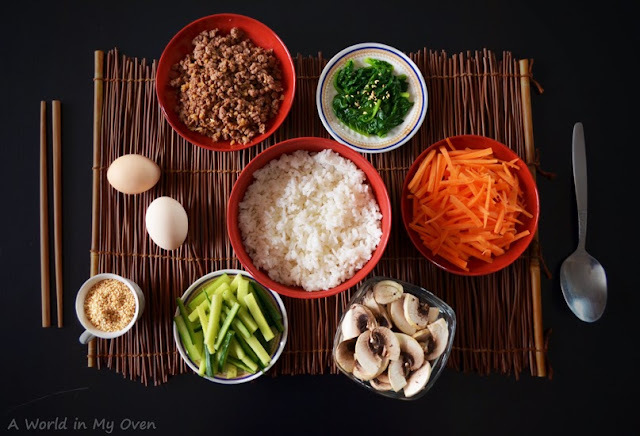 What I've noticed about bibimbap is that a whole lot of effort goes into it - from prepping every single ingredient to cooking and seasoning everything separately. I totally think it's worth it, but I am serving this dish half warm or microwaved or kept-warm-in-the-oven. I heard bibimbap is served in a piping hot bowl in order to keep the dish warm, or warm it up again, but I think that only counts for a specific version of bibimbap. All the other times it's served in a normal bowl. So I wonder how you're supposed to eat this. Any clues? 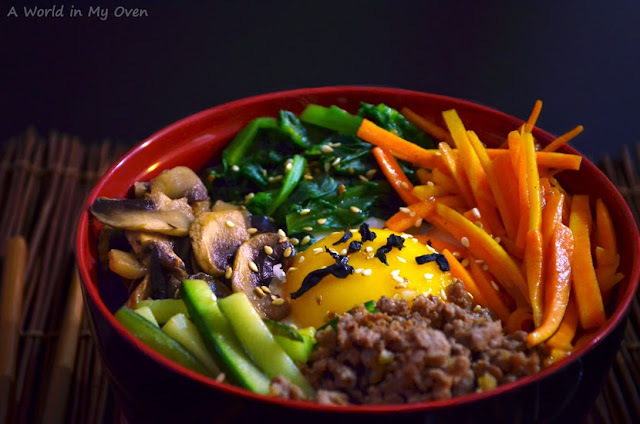 I actually find bibimbap a perfect way to use up leftover vegetables and/or rice. I'm not Korean so I feel I have the liberty to dump whatever vegetables I find into it, mix it with an egg and some rice and still call it a bibimbap. It's amazing. I really love the clean taste it gives (which might also be me under-seasoning the food as well - think of it as a 'free translation').